With well over 11 million views on social media, Sandy and Richard’s unique juxtaposition of modern, progressive, political and socio-relevant lyrics and tune-smithy jazz piano/vocal arrangements will charm your socks off. You could almost call it a musical version of Saturday Night Live. 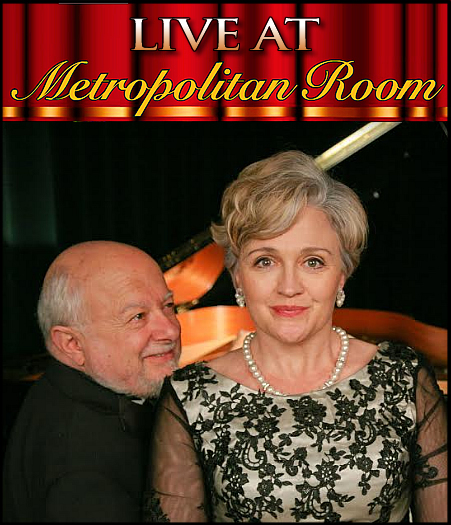 Sandy and Richard Riccardi’s Metropolitan Room show was a fun-filled hour of lampoons, jabs and jibes on a host of topical subjects. With mostly their own original songs, but with an occasional borrowed tune to which the pair wrote parodies ranging from puckish to cynical to contemptuous, they took sharp aim at, among other items, politicians, TV evangelists, Broadway musical wannabees, sexual orientation, and the Twitter explosion. The music and material gave Sandy Riccardi plenty of opportunity to establish her proficiency as a versatile singer and actress. If anything, she so immersed herself in the procession of characters she assumed that the audience might not have had time to appreciate the quality of her near-operatic voice. But sharp-witted content was more the show’s objective than was a musical recital. Richard Riccardi, Sandy’s husband, may have been sequestered behind the piano, but as her spouse, partner, musical director and accompanist he was a willing, and eminently salutary accomplice to the musical goings-on, much of which he composed and/or co-authored. Together, Sandy and Richard Riccardi made one hell of rib-tickling and satisfying cabaret night out.